In June 2016, Eric Bailly became Jose Mourinho’s first signing as Manchester United manager. Naturally, his acquisition was overshadowed by the arrivals of established stars Mkhitaryan, Ibrahimović and Pogba. The Ivorian was a relative novice having played only 46 games for Villarreal prior to the £30million move. Mourinho himself acknowledged Bailly’s rawness. Speaking back in July, Mourinho admitted there was a question mark over whether he would be able to play at the level required straight away. In just a few short months Bailly has answered that question and established himself as Manchester United’s number one centre back. Bailly has looked assured from the outset of his United career. He marshalled Jamie Vardy expertly in the Community Shield. Whilst Ibrahimović grabbed the winning goal that day, Bailly collected the Man of the Match award. He was named Man of the Match again in United’s Premier League season opener against Bournemouth. His blend of pace, aggression and calm assurance on the ball was heralded by fans too as he walked away with the club’s player of the month award for August. His over-exuberant slide tackle celebration away to Hull also endeared him to many. Bailly has clearly had an impact on Premier League strikers too. In recent weeks, Troy Deeney name checked Bailly whilst explaining Arsenal’s current travails. “When you play against Arsenal there’s no fear,” the Watford captain explained. “When you play against a tough centre-half like Bailly, you think ‘he’s going to give me a whack!’” Troy Deeney is known for his aggressive, all-action style of play, so the fact he has identified Bailly as someone who he ‘fears’ is certainly worth noting. Whilst Bailly has thrived, Smalling and Jones appear to have regressed. Injuries have disrupted both their campaigns. Whilst some may point to this as mitigation, I would not. It is impossible to build a team around a centre back partnership that cannot stay on the pitch. 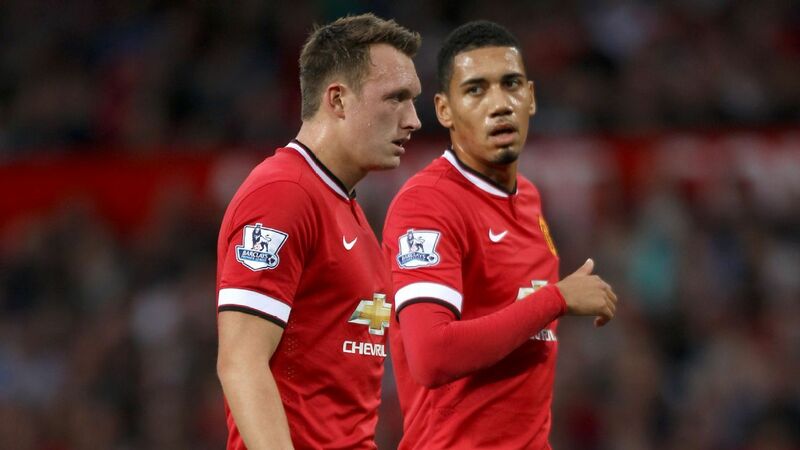 Smalling was signed in 2010 and Jones was signed in 2011. The two have been inextricably linked since then, heralded as a potential long term partnership for United and England. Neither has fulfilled their potential, particularly when compared to the legendary Ferdinand-Vidic defensive partnership. Ferguson’s suggestion that Jones could be as good as Duncan Edwards now seems overly optimistic at best. Meanwhile, Smalling continues to look like an accident waiting to happen when in possession. Despite his size and athleticism, he often finds himself bullied against physical strikers. This criticism certainly cannot be levelled at Bailly, who is regularly lauded for his aggressive style. This aggression got the better of Bailly on Thursday night. He became embroiled a silly brawl and earned himself a needless red card. Suspended for the final, United will now to turn to one or both of Jones and Smalling. The fact that Bailly has managed to perform so admirably is a damning indictment against Jones and Smalling. Arguably, both are facing a fight for their Old Trafford careers. In recent weeks, Mourinho has urged both to be more ‘brave’. Despite this, they could have a reprieve. The Europa League final could be the perfect platform for them to re-establish their claim as first choice centre-backs, winning a trophy and securing Champions League football at the same time. Ajax certainly boast some very talented, young forwards, Kasper Dolberg in particular looks a real threat. However, if Jones and Smalling cannot nullify the young Dane and his colleagues, can Mourinho trust them against Europe’s finest in next year’s Champions League?